After three consecutive days of declines in the stock markets, the downward trend may be about to break Wednesday. 1. Time for a push higher? 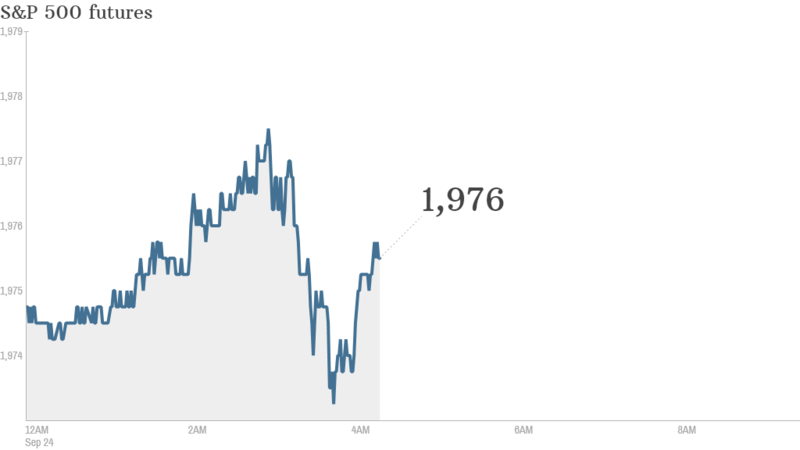 : U.S. stock futures were edging up into positive territory, but the gains were small. Markets have pulled back after hitting record highs last week but investors now seem to have regained their composure after being caught off guard by the U.S.-led airstrikes against ISIS in Syria. The U.S. said it also attacked other terrorist groups. A Pentagon spokesperson told CNN, this is "only the beginning." The Dow Jones industrial average lost nearly 117 points Tuesday, while the S&P 500 fell 0.6% and the Nasdaq slid 0.4%. 2. Bed Bath & Beyond: Shares in Bed Bath & Beyond (BBBY) are rising by about 7% premarket after the company reported a jump in quarterly sales after the closing bell Tuesday. 3. Economic data: The U.S. government will report new home sales made in August at 10 a.m. ET. 4. International overview: European markets were mostly edging lower in early trading as a new report showed Germany's business climate hit its lowest level in over a year. "The German economy is no longer running smoothly," Germany's Ifo Institute said. Europe's biggest economy has taken a hit over worries about trade with Russia, and will struggle to grow this quarter. Asian markets ended with mixed results. The Shanghai Composite index was the stand-out performer with a 1.5% gain.